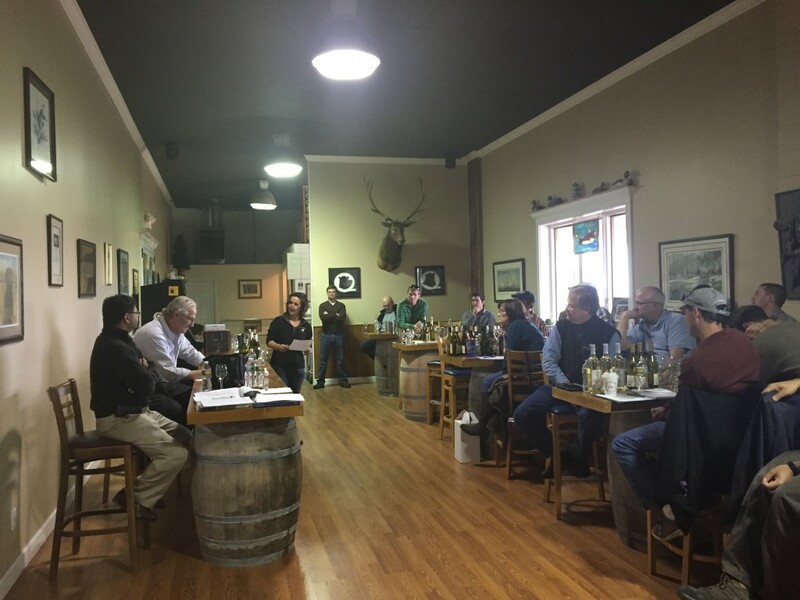 A ‘Chardonnay Wine Workshop’ was held on November 18, 2015 at Working Dog Winery, located in East Windsor, a small town in central New Jersey. 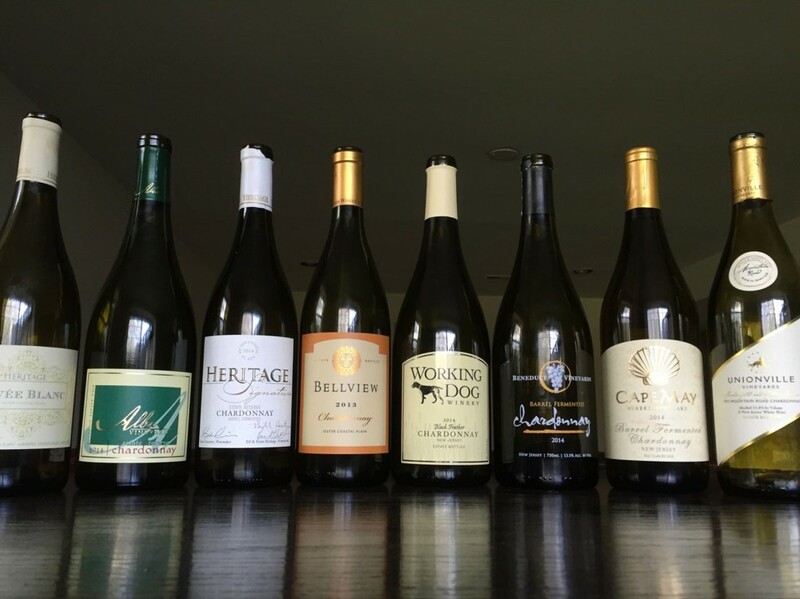 The purpose of the meeting was to taste and evaluate Chardonnay wines produced in NJ. Two weeks before the event, a survey was sent to participants (professional winemakers) to report on clones and rootstock choice, harvesting, and fermentation parameters. The survey responses formed the basis for discussions at the workshop. Fortunately, most of the growers have Dijon clones, which are cold tolerant, have known tolerance to crown gall, and produce smaller clusters (for more information read previous blog, Chardonnay Winegrape Clones for Cool Climates. Almost all the growers had Clone 95, Clone 96, or Clone 76. However, Beneduce Vineyards specifically chose Clone 809, which is a highly aromatic clone of Chardonnay with more intense citrus and tropical fruit aromas. In addition to Dijon clones, Bellview Winery had California Clone 17, which is known to produce consistently high quality wines. However, that clone suffered significant winter injury in the absence of snow cover and low temperature dips during the winters of 2013 and 2014; they have replanted that block of Chardonnay with Dijon clones. Rootstock ‘Couderc 3309’ (3309C) was the favorite during earlier plantings, however the growing trend is to use ‘Millardet et de Grasset 101-14’ (101-14) rootstock which is similar to 3309C, but often less vigorous. Growers are also beginning to explore ‘Riparia Gloire’ rootstock, its’ much shallower root system could prevent excess vigor in heavy soils or be an advantage in a vineyard with a shallow water table. For its low vigor and high Calcium site, Alba Vineyard has great success with rootstock ‘SO4’ (aka Selection Oppenheim #4) which has higher tolerance to lime and very high nitrogen uptake rates. Working Dog Winery has controlled the excess vigor from their sandy loam site by installing tile drainage during the vineyard establishment. However, due to scant limestone in their site, they lime their soil each year to bump up the pH a little bit. Heritage Vineyards uses both, 101-14 rootstock and own rooted plants, to hedge their bets for winter injury insurance. Harvest yields were in the range of 2.5 -3.8 tons per acre. It is difficult to compare the yields in terms of tons per acre because two vineyards with same tonnage may have different spacings, different inherent vigor, and therefore productive capacity. Bellview Winery believes that yield per linear foot of canopy is a better metric for comparing of yields. Most of the vineyards picked their Chardonnay when °Brix in the range of 21.5-23.5 and TA (Titratable Acidity) in the range of 7-8 (however TA is typically adjusted to a lower level, later during fermentation). The pH varied from 3.3 -3.6, some wineries with relatively high harvest pH, used tartaric acid to adjust the pH. When it comes to fermentation, most wine makers like to use yeast strain, CY 3079 that is specifically recommended for Chardonnay. Working Dog Winery uses a combination of CY 3079 and strain W-15, which works well for their cold tank fermentation. Bellview Winery and Auburn Road Vineyard & Winery use DV10, which reduces bitterness during fermentation. Heritage Vineyards uses Montrachet, which is neutral in sensory contribution, and for their crowd pleaser ‘Cuvee Blanc’ they use VL-1 in stainless steel fermentation. Cape May Winery & Vineyard ferments half a barrel with DV47 and half with Cross Evolution. Unionville Vineyards uses 5-10 different strains or their combinations, in different barrels. However, from the same juice, each strain brings out different flavors, textures and aromas. After 8 months of aging, they taste through the barrels and use the best ones for final blends. To know what works best and what does not, Hawk Haven Vineyard & Winery tried different strains such as Elixir, Cross Evolution and BM, for its complexity. Most of the wineries use medium toast French oak, new or used, with typical duration in oak of 6-9 months. Beneduce Vineyards uses a combination of French and American oak from several different coopers but all of them are 3-year air-dried, medium toast Bordeaux style barrels (225 Liters). Bellview Winery has more frequently used Hungarian and American oak while Auburn Road Vineyard & Winery uses Hungarian and French oak. More aggressive Hungarian oaks are good during the first year of use, for it gives a nutty character but should be used in addition to French or American oak to blend later. To add layers of complexity, some wineries use both, barrel and stainless steel tank fermentation; stainless steel allows for extracting citrus flavor and is used with fresh fruits while barrels adds oakiness, density and roundness. Some wineries did not want ‘oak’ in their wine hence throughout used neutral oaks and some avoided new oak since it could dominate the white grape juice. Auburn Road Vineyard & Winery noticed that some consumers who do not see ‘oak’ in the wine description, wouldn’t try it, and that consumer education can make them try non-oak wines. Cold soaking the berries before fermentation is not common for white varieties, however several wineries do use cold-settling. In cold settling, berries are allowed to settle in a vat for 2-3 days at 40-50 °F. It helps to clarify the juice and prevent unwanted flavors in the juice. Few wine makers mentioned that they harvest whole cluster and perform whole cluster press, which allows for clean lees and at the same time, wood of the ripened cluster contributes additional softer flavors. Mike Beneduce suggested the option of cracking open a door at night if you don’t have the ability to control temperature for your barrel fermentation. They line the barrels up by an overhead garage door and crack the door a few inches at night to let the cool air in, keeping the barrels at a lower temperature during fermentation. Cape May Winery & Vineyard emphasized that for white wines, heavy lees is a bad thing and should be racked at the earliest. On the question of did you perform Malolactic Fermentation (MLF)? Answers ranges from 0% to 100%, however most of the wineries used anywhere between 30 to 70% MLF. During MLF, tart Malic acid converts into less acidic, lactic acid with the help of bacterial strains. MLF is very much associated with Chardonnay giving a ‘buttery’ flavor to the wine. However, some wine makers do not do MLF at all because they like crisp acidity in their wines with a longer finish and the ability to pair better with food. For Working Dog Winery 100% MLF makes their Chardonnay, smooth and one of the favorites in their tasting room. However, most of the wine makers preferred the balance of both the flavors. Buttery character and acidic flavors also depend on the type of bacterial stain used and how much citric acid remains in the wine. Some use multiple bacterial strains to achieve different level of smoothness, however it was noted that ‘Hanson # CH35’ with fast fermentation kinetics is one of the most reliable MLF strains. The best part of the meeting was that everyone was open about how they accomplished their wines and everyone was taking notes!